Eddie Reeves’s father, a semi-famous photographer, has committed suicide and Eddie just wants to know why. When she meets Culler, a student of her father’s, Culler tries to help her make sense of her father’s legacy and could just possibly be the key to unlocking the mystery of his death. Courtney Summers is my go-to author for raw YA contemporary, and once again I was not disappointed. Though I may be getting tired of the death of a loved one angle in YA, when it’s done this well, I can’t complain. Summers captures that feeling of everything feeling meaningless after such a tragedy and has Eddie, who seems like she was a “good” girl before her father’s death, acting out and taking risks a teen in mourning might very well take. The relationships feel very real here too. Eddie’s long-term friendship with Milo is tested by both her semi-withdrawal, complicated feelings towards each other, and Milo’s crush on a girl who looks like Marilyn Monroe. Culler is an older boy, a “starving artist” as well as someone who promises answers and thus has an irresistible allure. Eddie feels let down by her mother whose grief has kept her in a bathrobe and homebound, and is annoyed by the take-charge Beth, who tries to get both Eddie and her mother functioning again despite her own pain. 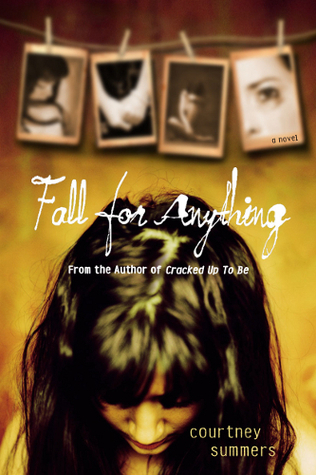 FALL FOR ANYTHING comes out in paperback tomorrow. Find out more about it on the author’s website. This sounds really good! I'm always down for a real and raw story like this. It irks me when you feel like the grief portrayed in the book is just so contrived. I'm going to have to check this one out! It's too true. Her books are true to point and pretty blunt, which, I believe, is awesome. Her book Cracked up to be made me cry and I had to pass it along to my baby sis (17 years). She felt the same. I read Cracked Up to Be yesterday and was blown away by it. Can't wait to read this one. I didn't like Cracked Up to Be, which makes it hard for me to pick up another Courtney Summers even though they all get good reviews. Argh. I definitely want to get one of Courtney's books ASAP! I've heard great things on this one! I can't wait to read it! I've been seeing this one around and the other review I read was favorable too...sounds like a great read. There does seem to be a lot of YA that deals with the death of a loved one, doesn't there? That being said, I really like the sound of this book and have been reading other good reviews of it, so I might take a chance on it. The cover is really unusual as well. I hear really good things about Summers, I guess I need to add her to my list. I've not read any of her books yet, but a middle-reader author and friend of mine swears she is the best thing since sliced bread. Going to have to get on her bandwagon! Just finished this one recently and absolutely loved it. oh cool. this one comes out in australia in march. will make sure to order some in for the shop (and me!). thanks! I just bought this one and it sounds amazing! I read Cracked Up to Be I'n a couple hours and really enjoyed it. Can't wait to dive into this one :) great review, Lenore!! Presenting Lenore is a blog to stalk!